SACRAMENTO, Calif. – CalPERS today reported a preliminary 8.6 percent net return on investments for the 12-month period that ended June 30, 2018. CalPERS assets at the end of the fiscal year stood at more than $351 billion. "While it's important to note the portfolio's performance at the 12-month mark, I can't emphasize enough that we are long-term investors. We will pay pensions for decades, so we invest for a performance that will sustain the Fund for decades." View Eliopoulos discussing the preliminary returns. Additional returns include fixed income, which earned 0.4 percent, while inflation assets returned 9.3 percent for the fiscal year. This brings total fund performance to 8.1 percent for the five-year time period, 5.6 percent for the 10-year time period, and 6.1 percent for the 20 -year time period. Over the past 30 years, the CalPERS fund has returned an average of 8.4 percent annually. "While we are pleased with the positive returns, we're focused on improving our funded status," said Marcie Frost, CalPERS chief executive officer. "This will take time and will require us to explore new, forward-thinking approaches to our investments, particularly in private equity. Our primary goal is to ensure that our fund is strong for years to come." Returns for real estate and private equity reflect market values through March 31, 2018. 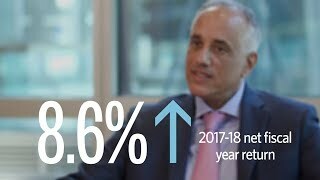 CalPERS' 2017-18 final fiscal year investment performance will be calculated based on audited figures and will be reflected in contribution levels for the State of California and school districts in Fiscal Year 2019-20, and for contracting cities, counties and special districts in Fiscal Year 2020-21. The ending value of the CalPERS fund is based on several factors and not investment performance alone. Contributions made to CalPERS from employers and employees, monthly payments made to retirees, and the performance of its investments, among other factors, all influence the ending total value of the Fund. For more than eight decades, CalPERS has built retirement and health security for state, school, and public agency members who invest their lifework in public service. Our pension fund serves more than 1.9 million members in the CalPERS retirement system and administers benefits for more than 1.4 million members and their families in our health program, making us the largest defined-benefit public pension in the U.S. CalPERS' total fund market value currently stands at approximately $356.82 billion. For more information, visit www.calpers.ca.gov.